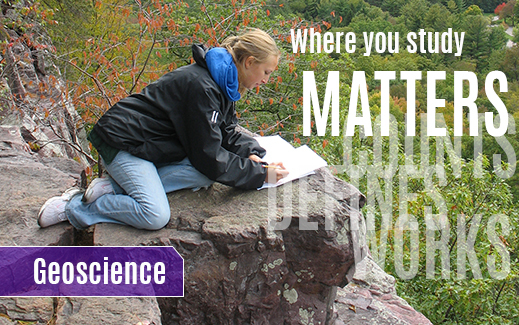 We are committed to providing high-quality classroom and field education in the many disciplines of geoscience. Our geoscience majors gain a solid foundation in chemistry, physics, biology, and math along with coursework in classic geological methods and topics as well as the broader perspectives of 21st century geoscience. Our degree programs stress integrated problem solving and a breadth of skills to prepare students for a wide range of potential career opportunities. Our faculty mentor students in original research projects and our students are recognized both regionally and nationally for the quality of their research. WSU is located in the beautiful Upper Mississippi River Valley, surrounded by classic exposures of Early Paleozoic sedimentary rocks. The region is part of the "driftless zone" that escaped the direct effects of the Pleistocene glaciation that covered much of the rest of Minnesota. Sinkholes and cavern systems are common in southeastern Minnesota, and crystalline rocks of the midcontinent rift system are less than a day’s drive from campus. Winona State's unique location enhances our programs’ field components and complements our modern, well-equipped classrooms and laboratory facilities. To apply for either the Coulee Rock Club scholarship or the Geoscience Alumni scholarship, visit the Academic Works website during the application period (typically early in the spring semester). Students interested in applying for the GALE scholarship should refer to the GALE Information and Application (PDF). Submission guidelines and dates are included.